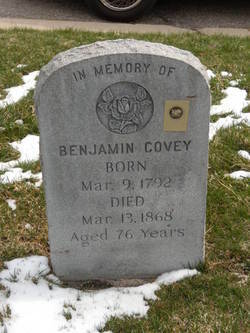 Benjamin Covey (1792-1868) came to Utah in 1849 after having been jailed with Joseph Smith and others at Liberty Jail, Missouri. He married Almira Mack Covey (1805-1886), Sally Clark Covey (b. 1796), Diana Cole Covey (1819-1847), and Elizabeth Skinner Covey (b. 1796). The Mack family history dates back to the 1600s. Little is known of the other wives.